scan n cut christmas card | Vintage Joy Etc. i was recently challenged by my twitter friend jess to create a christmas card using an electronic die cutter…i love the look of the simple word die cuts that everyone is using lately, so just knew i had to use that on my card, this is what i came up with…hope you enjoy! 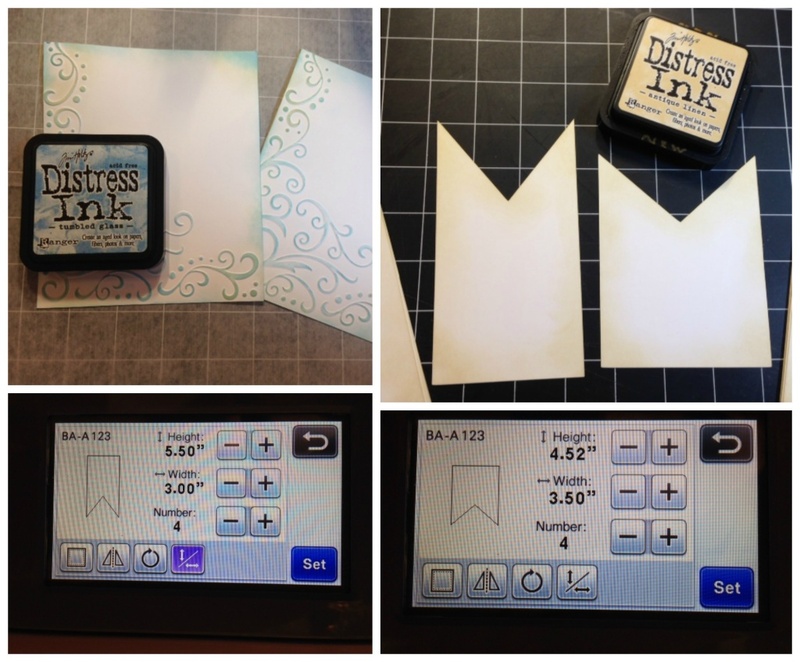 so, I started off by trimming a piece of strathmore bristol smooth card stock to 5″ x 14″ — then scoring at 7″, 9″ and 11″ i wanted my card to have a vintage ephemera look, so i inked all the edges with tim holtz antique linen distress ink, on both sides of the card. 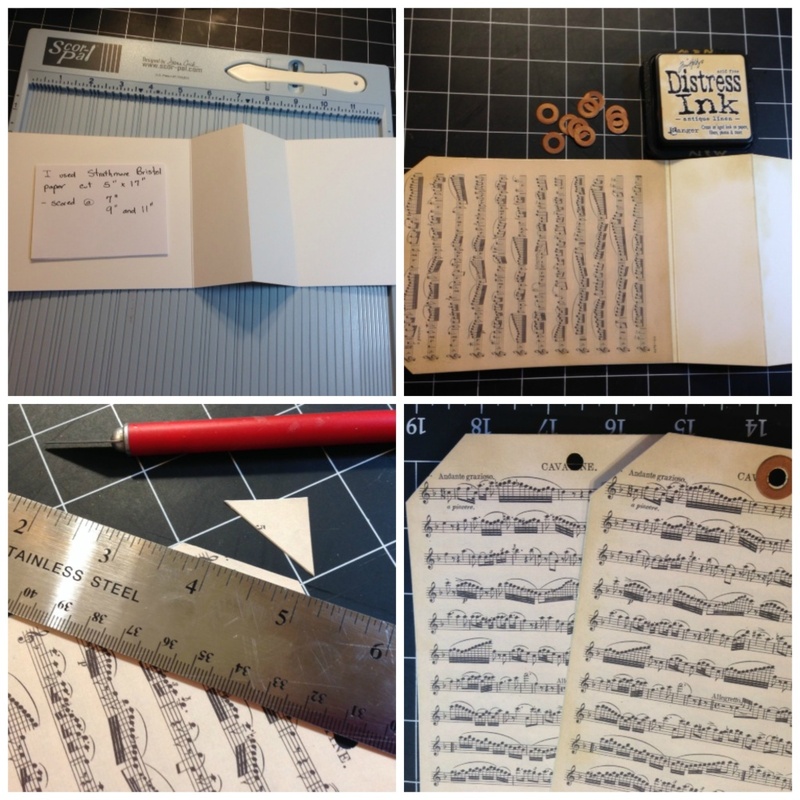 then i wanted to add a piece of vintage music paper, but my original was too large, so i reduced it down on my scanner/printer to just slightly larger than 5″ x 7″ — trimmed it and adhered it to the back panel of the card, trimmed the top corners and punched a hole to resemble a tag. next, i trimmed another piece of Bristol card stock to 4 ⅞” by 6 ⅞” and ran it through my big shot using the darice “corner scroll ” embossing folder. then inked that lightly with tim holtz tumbled glass distress ink. using my scan n cut machine, i cut out two different sized banner pieces from bristol card stock, using the software in the machine (see photos of actual sizes cut), and again inked with antique linen distress ink. 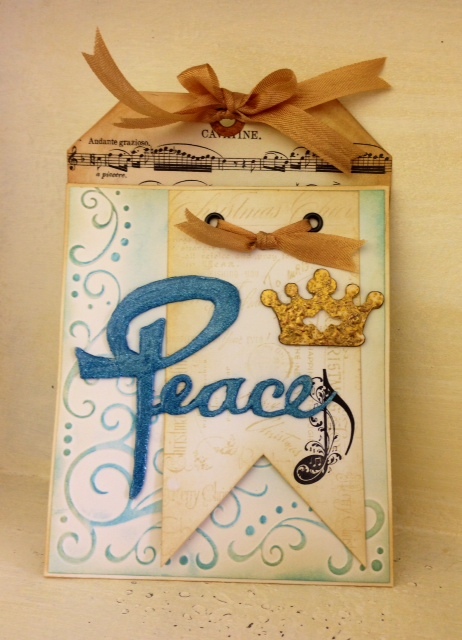 i also stamped the front of both banners using the stampendous christmas background cling stamp. 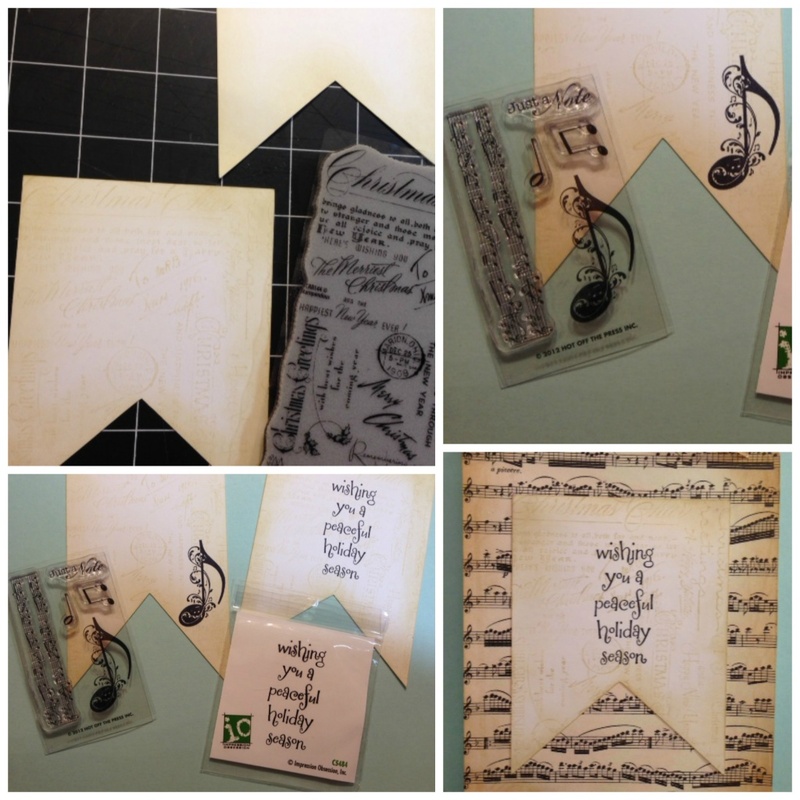 additionally on the banner for the front of the card, I stamped a decorative musical note clear stamp from “hot off the press” using black archival ink — and on the banner for the inside of the card I stamped a sentiment from impression obsession. i glued the longer narrow banner to the top right side of the embossed piece, then added two eyelets, threaded vintage seam binding through the holes and tied a small square knot. then i got to work on the most unique part of the card, the hand-written word “die cut”. i looked online for inspiration for a font style i liked. then once i had decided on the style i wanted to use, i practiced sketching out the word “Peace”, using my black pitt pen brush tip marker. once i was happy with the design, i scanned it into my scan n cut machine and slightly resized it to fit the front of my card. i cut out three of same size, and glued them together on top of each other, to give it some dimension. 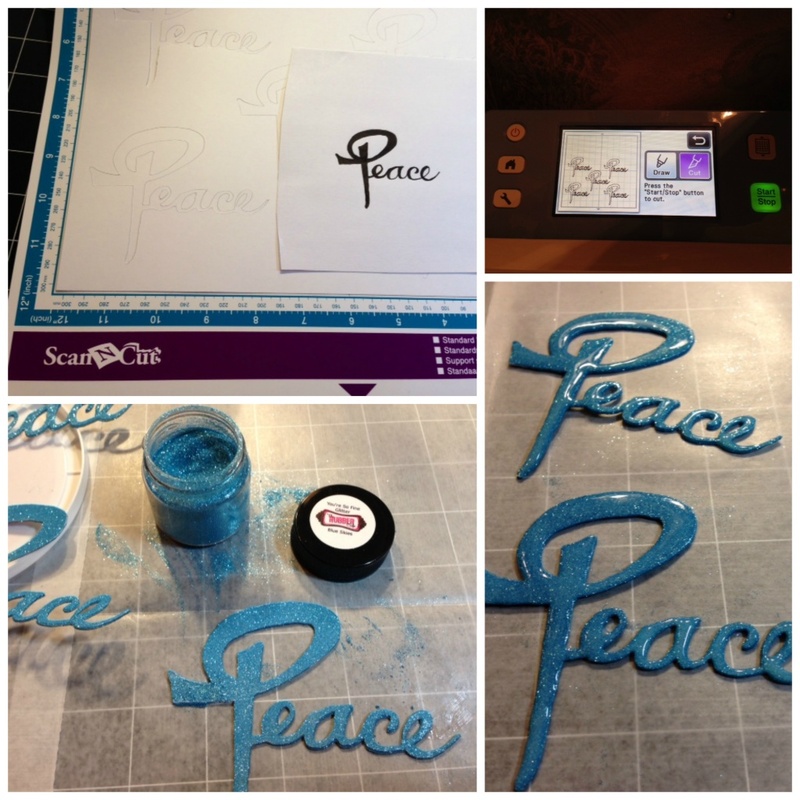 then i glittered my handmade “die-cut” with micro fine glitter in the “blue skies” color…but to keep the glitter contained, i covered the whole die cut in glossy accents and set them aside to dry overnight. 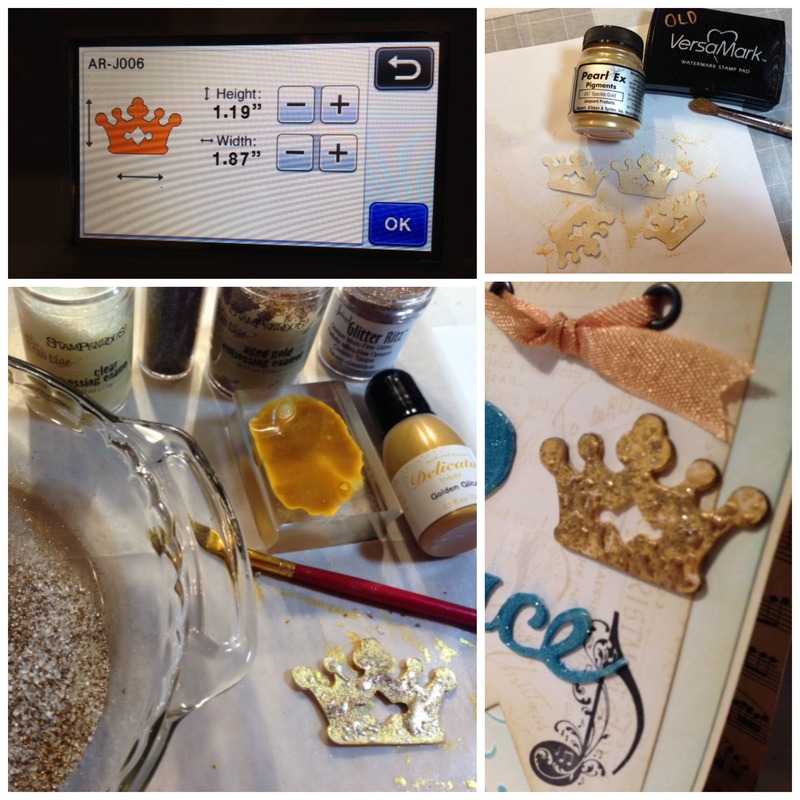 i thought the card front still needed something, so I tried a few options, finally deciding on the crown (an existing file in my scan n cut software) i cut out three identical crowns in the smallest size, glued them together and tried using gold sparkle pearlex powder, but it wasn’t sparkly enough for my liking…so i embossed the crown using versamark, gold embossing powder and tiny bits of frantage embossing powder and glitter, just to give it some added “bling” & dimension. i assembled the card using scotch quick dry glue, and adding the stamped banner/sentiment on the inside of the card. i finished everything off by adding another double bow using my vintage seam binding ribbon. i’m pretty pleased with how it turned out, considering i’ve never used my machine to do that before…so thanks Jess for the challenge!